What is TRACK Hospitality Software? TRACK Hospitality Software is an application that gives businesses all the core elements of an enterprise call center, marketing, and property management software in a single comprehensive and integrated package. This cloud-based system enables businesses to implement better lead and prospect management, deploy a fully functional and integrated call center, and perform smarter email marketing without the complicated hardware and heavy price tag. With TRACK, you are able to capture large quantities of highly qualified leads and turn your prospects into guests. Users will also enjoy versatile communications and more targeted email marketing with their prospects and guests, thanks to custom templates, messaging, set reminders and activities. Plus, the software is based in the cloud. It is quick and simple and doesn’t require you to set up any hardware or download any application to make TRACK work for your business. 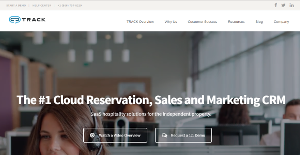 Designed to help businesses in the hospitality industry generate more leads and convert prospects into actual guests, TRACK is a cloud SaaS hospitality solution worth considering. For one, TRACK comes with a very wide and integrated feature set that combines all the functionalities and capabilities of an enterprise call center, marketing and property management software. Those who are not quite well versed in the technical side of things need not worry about TRACK. The system is quite friendly even to novice users, which is a great thing if you want a software that will help you address the needs and demands of your current and prospective guests while at the same time, turn more leads and prospects into bookings. TRACK simplifies the way you manage your properties, thanks to its powerful and robust property management and reservation functionality. Whether you offer five rentals or 5,000 rentals, TRACK helps you streamline all your processes, enable you make smarter business decisions that are based on actual data, and grow your bookings. Friendly and easy to implement, TRACK is also built using the best technology and innovations, ensuring users of smooth scalability, unparalleled reliability, and a 99.99% uptime guarantee. Developers work hard to constantly improve TRACK. Using agile development processes, developers are able to roll out a new release to the software on a weekly basis. If you are interested in TRACK Hospitality Software it could also be sensible to examine other subcategories of Best Hotel Management Software collected in our database of SaaS software reviews. Organizations have different wants and requirements and no software application can be just right in such a condition. It is useless to try to find an ideal out-of-the-box software product that meets all your business requirements. The intelligent thing to do would be to adapt the solution for your unique needs, employee skill levels, budget, and other aspects. For these reasons, do not hasten and pay for well-publicized leading solutions. Though these may be widely used, they may not be the ideal fit for your particular needs. Do your groundwork, check out each short-listed application in detail, read a few TRACK Hospitality Software reviews, call the vendor for explanations, and finally settle for the application that presents what you want. How Much Does TRACK Hospitality Software Cost? TRACK is a quote-priced system where users are provided with individual SMB/enterprise pricing packages to meet their specific needs. Contact the company for more details, and ask for your quote. We realize that when you make a decision to buy Hotel Management Software it’s important not only to see how experts evaluate it in their reviews, but also to find out if the real people and companies that buy it are actually satisfied with the product. That’s why we’ve created our behavior-based Customer Satisfaction Algorithm™ that gathers customer reviews, comments and TRACK Hospitality Software reviews across a wide range of social media sites. The data is then presented in an easy to digest form showing how many people had positive and negative experience with TRACK Hospitality Software. With that information at hand you should be equipped to make an informed buying decision that you won’t regret. What are TRACK Hospitality Software pricing details? What integrations are available for TRACK Hospitality Software? If you need more information about TRACK Hospitality Software or you simply have a question let us know what you need and we’ll forward your request directly to the vendor.